CHICAGO, Oct. 15, 2014 /PRNewswire/ -- United Airlines today announced plans to outfit more than 200 two-cabin United Express regional jets with Wi-Fi and personal device entertainment, with the first Wi-Fi-enabled flights expected later this year. The airline intends to install Gogo's ATG-4 advanced air-to-ground Wi-Fi product on E170, E175 and CRJ700 aircraft and to complete planned installations by next summer. Early next year, United expects to expand personal device entertainment to these aircraft, enabling customers to select from a wide range of movies and television shows to view on their Wi-Fi-enabled iOS and Android devices using United's mobile app, as well as on laptop computers. "United is pleased to extend our growing Wi-Fi and personal device entertainment platform to our fleet of larger regional jets," said Jeff Foland, United's executive vice president of marketing, technology and strategy. "These new elements will enhance the entire in-flight experience for our customers." Freshly prepared food for premium-cabin customers on United Express flights beginning in 2015. More than 180 mainline aircraft with personal device entertainment, including all Boeing 747s and Airbus aircraft and nine Boeing 777s that primarily fly between the continental U.S. and Hawaii. United plans to offer personal device entertainment on more than 200 mainline aircraft by the end of this year. United Airlines and United Express operate an average of more than 5,200 flights a day to 374 airports across six continents. 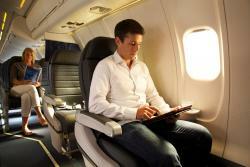 In 2013, United and United Express operated nearly two million flights carrying 139 million customers. With U.S. mainland hubs in Chicago, Denver, Houston, Los Angeles, New York/Newark, San Francisco and Washington, D.C., United operates more than 700 mainline aircraft and, in 2014, is taking delivery of 35 new Boeing aircraft, including the 787-9 as the North American launch customer, and is welcoming 32 new Embraer 175 aircraft to United Express. The airline is a founding member of Star Alliance, which provides service to 192 countries via 27 member airlines. More than 85,000 United employees reside in every U.S. state and in countries around the world. For more information, visit united.com, follow @United on Twitter or connect on Facebook. The common stock of United's parent, United Continental Holdings, Inc., is traded on the NYSE under the symbol UAL.